Designer Care Cliner, manufactured by Winco Manufacturing, is a premium clinical recliner with great range of capabilities. These clinical recliners, because of their high functionality, are particularly exceptional for use within the fields of dialysis, oncology, and acute care. 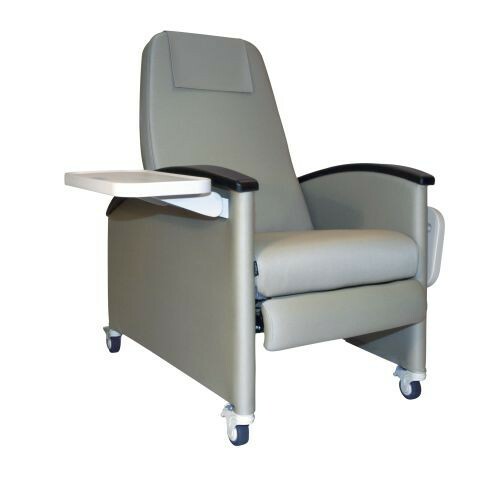 Every treatment chair in this Care Cliner series features a standard Trendelenburg release. Trendelenburg is a supine position when an individual's feet is stationed approximately 10-30 degrees above the head, sloped at an angle. When clinicians or technicians are ready to free a patient from this position, all they have to do is gently pull the accessible lever from either side. In addition to bilateral release handles, this modern gerichair features durable and comfortably contoured arms for greater patient comfort. This clinical recliner, furthermore, incorporates pedestal feet instead of casters for a "home furniture" appearance, which puts patients at ease and makes them feel more comfortable in a clinical environment. As a result of these integrative features, the Designer Care Cliner is the ultimate in comfort, durability, and aestheticism. Order now and see first-hand why patients and clinicians love this chair. Increase your patient satisfaction and clinic's efficiency today! If this chair does not meet your clinical needs, make sure to check out our selection of other treatment chairs, such as this gerichair or clinical recliner, here. Available with nylon casters or a foot pedestals. Capable of achieving the Trendelenburg position. Great for a wide variety of clinical settings. Unparalleled comfort, durability, and style. Product Numbers: 6700 and 6704. Height: 47 in. (119.38 cm.). Application: To assist with quality patient care.